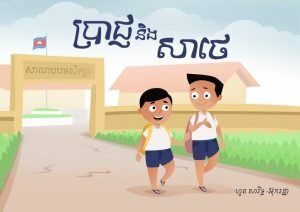 For parents that want to select a different bed time story for your lovely children and don’t know where to find them in Phnom Penh, Let’s Read app can help. 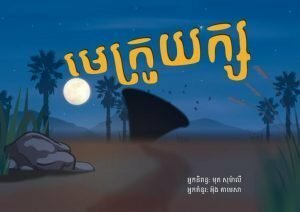 These new stories was written by Khmer writer. The benefit of reading aloud and sharing stories with your child is a great way to spend time together. Reading and storytelling also helps promote language, literacy and brain development. 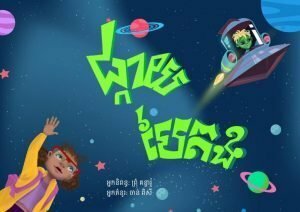 Tito and Rika fight over a mobile phone when, by accidentally pressing a button, a UFO arrives. An alien appears at the door and asks them to come aboard. Along with a puppy and firefly, they go on a grand adventure in the spaceship. But next morning they wonder – was it all a dream? Sophy is a very smart bee. She flies fast and collects nectar quickly, but she doesn’t get along with the other bees. 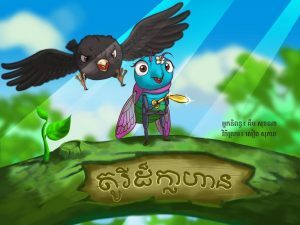 One day, Sophy flies away from her group to seek a mysterious purple flower at the top of the tree and quickly runs into danger. 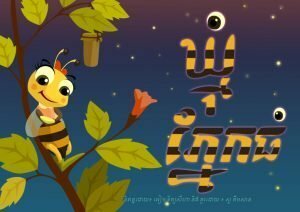 When a firefly and her fellow bees come to the rescue, she realizes the value of friendship. A female cicada, Tory, wanted to join the flying competition. She was told that only male cicadas participate because female cicadas cannot fly as fast. Undeterred, Tory practiced by herself and showed up at the competition. Will she be able to outperform other male cicadas? and why did she try to scare her brother? Kongkea lived with her father and brother on a floating village. She wanted to join her father and brother on their fishing trip, but she was told to stay at home and look after a floating garden. 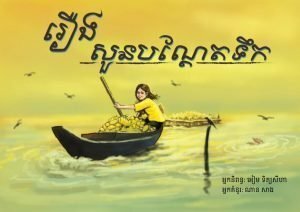 One day, the floating garden mysteriously floated away from her home, and Nita decided to row the boat out for the first time in search of her garden. A grade 6 student named Prach is bullying Sathae, a grade 4 student. Sathae really wants to ask for help but is afraid Prach will give him an even harder time. 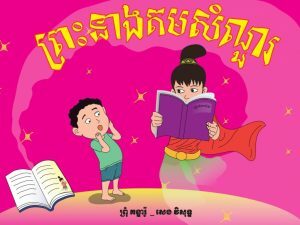 One day, Vety, his close friend, finds out about it and tells his teacher. The boys learn to resolve the conflict and in the process discover surprising insights. Every night, a giant bird came to catch insects for food. The insects became very scared. One clever female cricket had an idea, but she had to convince others to come together to carry out the plan. Nita loves science. She enjoys inventing useful things such as compasses and light bulbs. One day, she heard a loud bang on the mountain behind her house. She went to look where the noise was coming from, and found a ‘green’ boy. They became friends, and Nita used her knowledge in science to help the boy find a way to go back home. The Sun was no longer rising in Srey Pov’s village. She wanted to travel to meet the Sun and find out why. 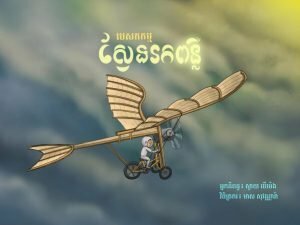 Despite objection from the village’s chief, Srey Pov built a flying contraption to visit the Sun and eventually brought light back to her village. Chamnan likes to listen to stories. But he asks a lot of questions, some of which are difficult for his father to answer. One night he dreams of a character from a storybook — a princess under the spell of a witch. Chamnam asks the princess many questions and breaks the spell. In the morning, he is excited to tell his father the tale of the storybook princess. Spending your time today to motivate them to read. 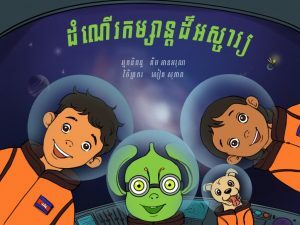 Kids can read free fun educational books on this site: https://www.letsreadasia.org or download the Let’s Read! From the Google Play Store. Let’s read is a digital library with many books available to the public for free. 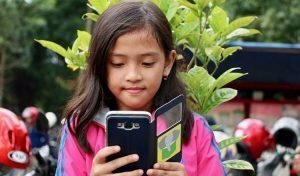 Let’s read is a project by the Asia Foundation, sponsored by Smart Axiata.